One of the great things about cruising in an 'interesting' boat is that it's easy to meet people. People are just naturally curious about an old fashioned boat like the Blue Moon. Back in Cedar Key, as soon as I rowed ashore, I met three nice people who had admired the Blue Moon from the pier and wanted to know what kind of boat she was and where I was going. Of course, half the people look at me like I'm a bit nuts, when I tell them, but the other half looks wistful and you can tell they long to cast off, too. I try not to tell them how much work it is! But while anchored in Tarpon Springs, a cruising couple named Dave & Louise rowed by to say hi, and to offer a dingy ride into town. Since I'd been thinking of rowing the 3 miles up river, I jumped at the chance to hitch a ride. While Dave & Louise hiked off to the grocery store, I decided to wander through the tourist shops along the water front. The diver on the roof was all over town! You can sum up Tarpon Springs with two words: Greeks and sponges. 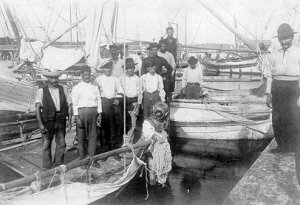 The Greeks started arriving in the 1880s to work in the growing sponge business, and that early prosperity gave Tarpon Springs has what this New Yorker would call a 'real' downtown/waterfront. That means brick buildings that have been around for a hundred years or so. A hundred years ago, those buildings housed sail makers, boat builders, hoop makers, coopers, and all the other craftsmen required to keep a large fleet of sailing craft at sea. Today, the sponge fleet is still in business, but the attractive water front area is given over mainly to restaurants and something I've never seen anywhere else -- sponge shops. They say you can't visit Tarpon Springs without buying a sponge, and I certainly didn't break the rule. These sponges come in a large number of types and sizes. Each shop had them sorted into baskets, labeled 'Yellow Sponges' or 'Wool Sponges'. I must say I didn't see the attraction, at first. They all seemed hard and rough. Not at all like those soft, florescent pink ones they sell at the grocery store. The revelation comes when a store clerk -- and they all seem to have Greek accents -- takes a sponge out of your hand, puts it in water, and hands it back. Wow! that hard, rough sponge is suddenly transformed into a soft, cool, luxury item that would be just the thing for taking a sponge bath on a small boat at the end of a long hot day. It does seem like everyone in Tarpon Springs is of Greek heritage. And, indeed it has the largest percentage of Greek Americans in the country. Most of the shops have icons hanging on the wall behind the cash register, and there's a Greek Orthodox cathedral a few blocks from the water front that I wanted to see. It was a bit of a walk, but well worth it. Walking into the cathedral was like stepping off a hot Florida street, directly into a bit of Europe. I appreciated a few, cool, quiet minutes, admiring the architecture and iconography, and lit a candle for fair winds and safe seas. Tomorrow, I set sail towards Tampa. My goal is the Manatee River, on the south side of Tampa Bay, but it looks a bit far for a one day sail. We'll see! Tarpon Springs: worth a visit! Bet you can't resist the sponges! Nice trip. It looks like summer in Florida. By the way: did you test your outboard already? Just in case of emergency. Way back in the early eighties we were anchored out the river opposite where the tourist boats would watch the sponge divers. Early in the morning, before the tour boats, we would watch a skiff come out & "plant" a fresh set of sponges for the divers to "harvest" for the tourists - very funny. Regardless we loved Tarpon Springs!